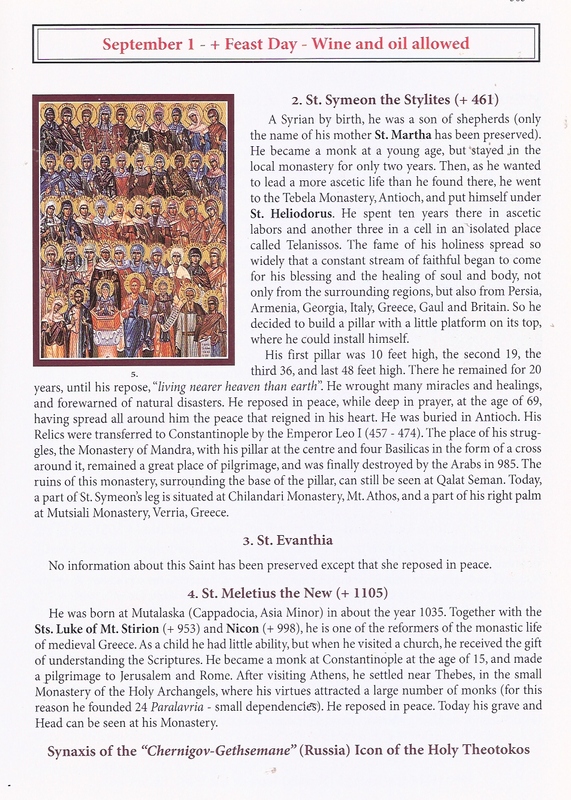 The Illustrated Synaxarion of the Orthodox Church was compiled by Antonios Markou, (MA Ph); "St. Symeon the Translator's" Centre for Hagiographical Studies, Athens, Greece. The Illustrated Synaxarion of the Orthodox Church was compiled by Antonios Markou, (MA Ph); "St. Symeon the Translator's" Centre for Hagiographical Studies, Athens, Greece. The 1st edition was published in Greek in 2002, and the 2nd edition was published in English in 2004, in Athens, Greece. This publication is no longer in print. If it is reprinted by the copyright holder, all images and pdfs from The Illustrated Synaxarion of the Orthodox Church will be removed from this website and will be replaced by a link to purchase the book from the publisher. This site may contain copyrighted material the use of which has not always been specifically authorized by the copyright owner. We are making such material available in an effort to advance understanding of environmental, political, human rights, economic, democracy, scientific, and social justice issues, etc. we believe this constitutes a ‘fair use’ of any such copyrighted material as provided for in section 107 of the US Copyright Law. In accordance with Title 17 U.S.C. Section 107, the material on this site is distributed without profit to those who have expressed a prior interest in receiving the included information for research and educational purposes. For more information go to: http://www.law.cornell.edu/uscode/17/107.shtml. If you wish to use copyrighted material from this site for purposes of your own that go beyond ‘fair use’, you must obtain permission from the copyright owner.